Each year, the day after the first training run of the spring sees club officials exchanging emails and text messages. Usually, the commentary centres on who trained, who didn’t and who might have caught the eye. This morning, there was some of that, but when Football Operations Manager Marcus Allan received a text at lunchtime, he nearly choked on his raw tuna Tonomi roll. “Big news, double big news” Cuz spluttered, offering up his phone as proof. And that’s when we learned that Nick and Chris Prowse had both committed to play for the Red ‘n Blacks in 2019. The short and the long of it: Nick and Chris Prowse. The brothers, who both stand higher than 200cm (6’7” in the old), will return to their old stomping ground at Barkers Road soon. Both played at Port Melbourne and departed the Borough at the same time that skipper Dan Noonan returned to the Claret and Stout, bringing the Johnston brothers with him. Next season, that band will be getting back together. 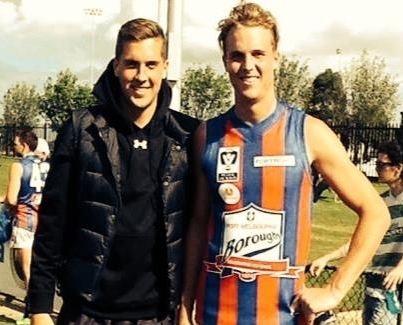 After leaving North Port Oval, Nick and Chris Prowse have played at Maribyrnong Park in the EDFL. Nick played 15 games for the season and booted 30 goals. Chris handled the hit-outs for the Marby Lions. President Matt Cosgrave was delighted with the commitments. “We’ve had our eye on the pair for a few years and we are delighted they are coming home. I’m sure they will really enjoy their football at the Old Xavs and help our club to greater success in 2019,” Cosgrave said. New coach Paul Satterley was rapt with the signings. “These boys further complement a list that is really taking shape. Once again, it is a great reflection of the hard work put in by key stakeholders at our club,” he said.